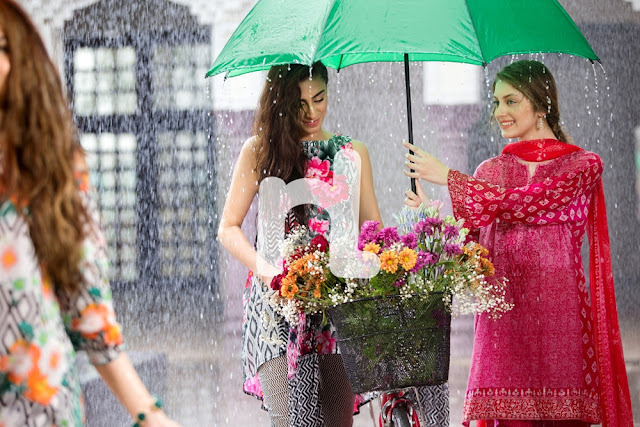 Press Release: Nishat Celebrates Monsoon with “Sawan Collection”...!!! 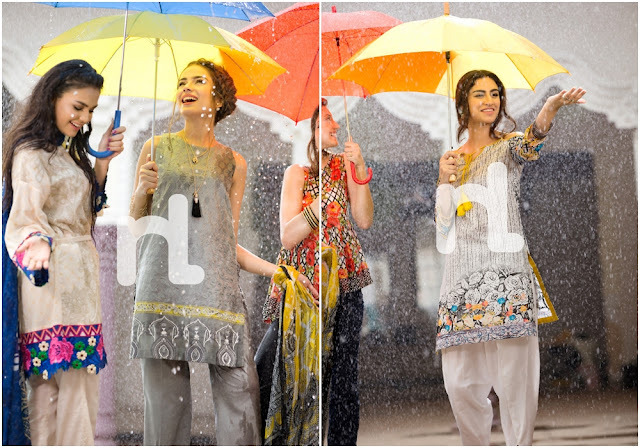 Nishat Linen celebrates this fabulous monsoon season with the introduction of their new “Sawan Collection,” available nationwide in stores & online from 20th of August 2016. Borrowing its ethos from the monsoon season and nature itself, Nishat’s Sawan collection aims to encapsulate the freshness and vibrancy that permeates after a heavy rain shower. The collection including boats of colorful range of botanical prints along with other thematic inspirations such as vintage gold, architecture, festivity and gardens. The collection consists of a wide range of variety including 32 distinctive designs of unstitched fabric fromNishaand66 gorgeous pret designs for women including fashionable silhouettes with intricate details. The collection includes a wide range of formal trousers, tulip shalwars and all over embroidered trousers with detailing that brings out the confidence & comfort. The prices for the Sawan collection start from PKR 2,400 and go upto PKR 8,900. Nishat Linen is one of the biggest textile and home fashion retail chains in Pakistan that has redefined the industry with acute attention to quality, design and affordability. With an online store supplementing 72 outlets in 26 cities and expanding across the country, NL truly lives its motto: the fabric of Pakistan. NL boasts of international retail presence in Dubai, Abu Dhabi, Saudi Arabia and Canada as well. With an attitude that is accessible to all and promise to never compromise on quality, NL is a trusted retailer that is clothing generations across the country. Review: Some Bling from Born Pretty Store...!!! 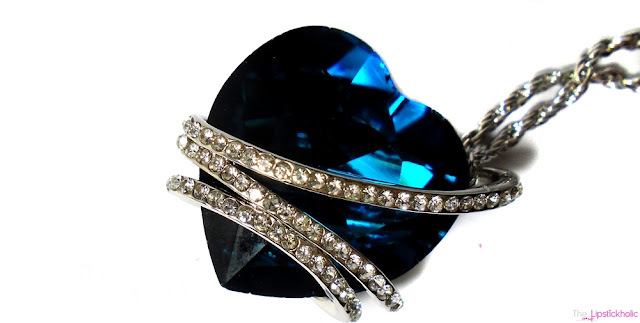 This chic crystal heart pendant is the first thing that caught my attention. It is absolutely gorgeous. I got it in blue color and it looks very elegant. The silver chain of the pendant is pretty long. 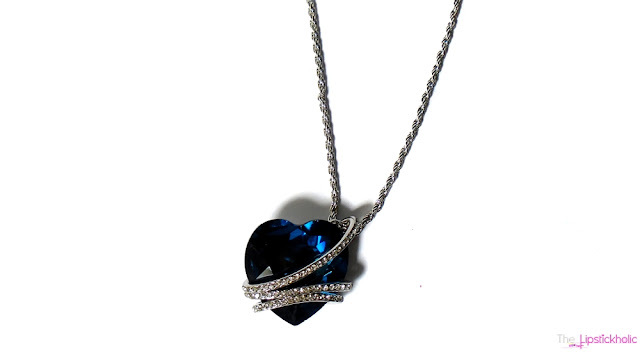 Overall, I totally adore this heart-shaped pendant. 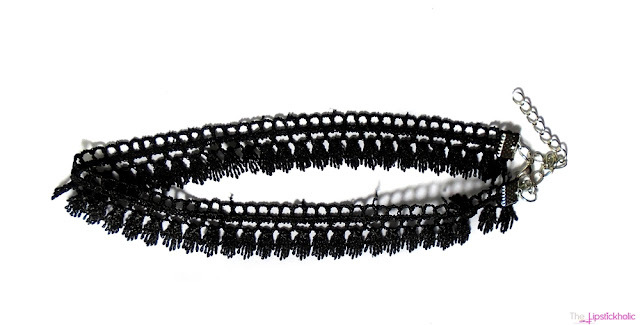 Lace/elastic choker necklaces are back in fashion and therefore I wanted to get my hand on this unique piece. This lace clavicle necklace looks really elegant and is comfortable to wear. If you have been following me on my social accounts, you would have seen me wearing this on Eid. I see myself wearing this quite a lot as I loved how it looked around my neck. My jewellery hauls seem incomplete without rings and this time I got this really stylish yet elegant golden ring with rhinestones. It looks really pretty and the size can be adjusted easily. The color of the ring has not changed or fainted so far. Yet another great addition in my rings collection from Born Pretty Store. This black and golden pair of earrings with rhinestones has to be my favorite pick among all the accessories I got this time. I wore these on Eid and got tons of compliments on my earrings. These are lightweight and extremely comfortable to wear. The quality of the earrings is great for the price and the color has not changed or faded so far. These earrings are perfect for formal and semi-formal events. I absolutely love these. 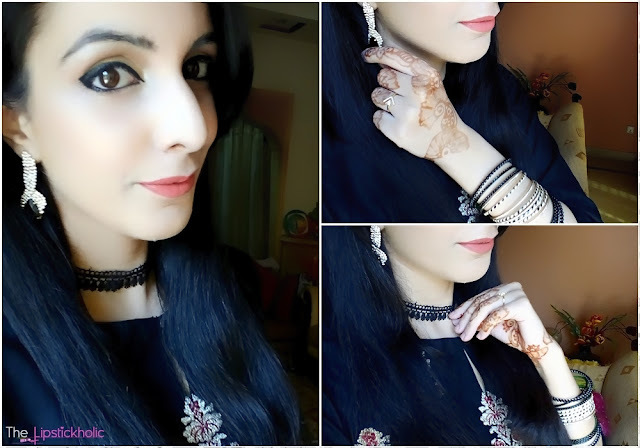 Overall, I really like my new jewellery picks from Born Pretty Store. The quality of jewellery is great like always and all the pieces are absolutely gorgeous. I recommend all jewellery lovers to check out the amazing variety of Jewellery & Accessories at Born Pretty Store. I am sure you will love their collection. Price & Availability: These jewellery items are available online at Born Pretty Store under their Jewellery & Accessories section. Prices are mentioned with each picture along with links. Press Release: Sheeba Kapadia Launches New Collection "ASPIRE"
Karachi, July 22nd, 2016 - Sheeba Kapadia has launched her newest collection - "Aspire" - which focuses on contemporary couture that represents sophisticated, elegant and timeless fashion. Each dress is individually designed to create a chic and voguish look. It includes outfits such as “Zard Peplos“, “Lilac Temples”, “Imperial Tunic” and “Coral Cranes” that have evocation of Baroque patterns and Chinoiserie motifs and artwork. Keeping up with her signature style, Aspire also includes “Jahanara” which is unique for its extremely intricate leather and velvet applique work and mosaic patterns on the boot cut pants. The collection also features “Feroza” that has a silver and gold organza applique work that gives it a very tasteful outlook. "Whenever I design a new collection I always bear in mind that I carry the meaning of what my brand stands for, which is the promise to uphold uniqueness and integrity. I always incorporate the latest fashion trends that are not only stylish but are also immutably elegant. For Aspire, I have made excessive use of detail and have united the classic vintage style with modern fashion." says Sheeba Kapadia regarding her newest collection. The Sheeba Kapadia brand has brought a phenomenal and unique fashion trend in the industry and her collections have a wide range of luxury pret, formal and bridal wear that complements women who truly appreciate extravagant couture. Aspire is now available in Sheeba Kapadia's Karachi outlet at Shop # 1, Plot # 3C, Lane 9 of Bukhari Commercial, DHA Phase VI, and also online at www.sheebakapadia.com. For more information regarding the brand, log on to www.facebook.com/SheebaKapadiaOfficial or visit www.sheebakapadia.com. Review: Forrest Green Lawn Suit by SNM Lawn...!!! Hope you all are doing good. As you all know summer season is at its peak and so is the "Lawn Mania". Today am reviewing a lawn suit from SNM Lawn's latest lawn collection. This particular design that I am reviewing is called "Forrest Green". It is the first ever lawn suit that I have tried from SNM Lawn by Din Industries. So let's get to the review to read my thoughts on this lawn suit. Forrest Green is a 5 piece lawn suit with Embroidered patch for trouser. The suit consists of: Digital Printed Embroidered Front Piece of 1.25m. Digital Printed Back Piece of 1.25m. Digital Printed Sleeves: 0.75m. Trouser: 2.5m and Patti for Trouser: Embroidered 1m. Dopatta: Digital Printed Silk 2.5m. 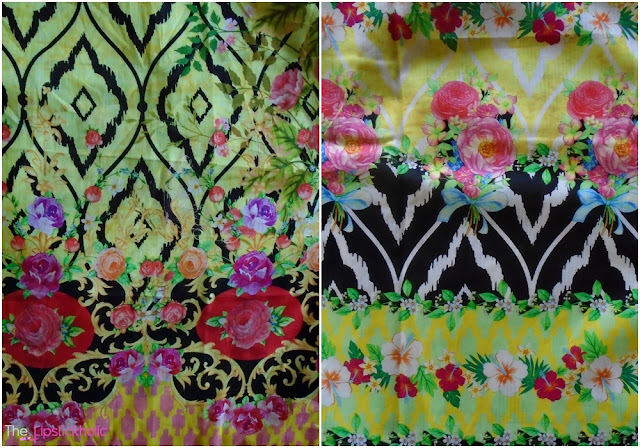 The front of this lawn suit is digital printed along with some embroidery. The embroidery is pretty neat and fine. The back and sleeve pieces are digitally printed too. The trouser is plain and it comes with an organza embroidered patch/patti to add some glam to the trouser. The silk digital print dopatta adds extra charm to the whole suit. The colors of the suit are bright and vibrant, just as they are shown in the picture on website. The print and color scheme of this suit is summer-appropriate. The quality of this lawn suit is really good. The fabric is comfortable and great for summers. Even after washing, it hasn't changed so far. However it is not wrinkle-proof but the company doesn't claim it to be wrinkle proof anyways. So that's not a big deal. Overall, I really liked this SNM Lawn suit. I think the quality of the fabric is really good and it is surely worth the price. Price & Availability: SNM Lawn Suits are available at leading stores nationwide. Also available online at SNM Stores Website. Price of this Green Forest suit is Rs 4,750. Prices of other suits are mentioned on the website. For more information on the brand and its latest launches and offers, join SNM on Facebook.